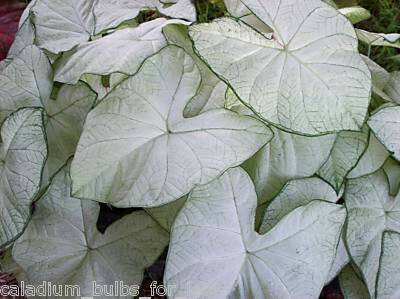 The Moonlight is a breath taking white Caladium that looks absolutely spectacular in any landscape!! It also looks stunning when planted in a decorative container!! She has a beautiful white leaf with very pale, thin green veins and a thin green border. It almost looks luminescent at dusk. If you like White caladiums, you're going to love Moonlight! !